Do you like cake for breakfast? Me, too. In case you're one of those people who feels guilty about eating cake for breakfast (are there people like that? ), this cake is 100% guilt-free. It's a BISCUIT cake! See, totally breakfast food. White Lily Flour is new to me, although I know I have heard of it. My grocery store doesn't carry it, but I was more than happy to do a little baking and test it out. Back to baking...White Lily sent me a few recipe booklets, some flour, a Cuisinart mixer (! ), and a few other goodies that you'll see in a minute ('cause you might win them). I was totally inspired by one of their recipes, changed it up a bit here and there, and made this Maple Pecan Biscuit Cake. Let me tell you, this little cake is going in my regular rotation for breakfast to serve when we have company. It serves 9, but once our little family of 3 was finished with it, there was less than half a pan left. Weird. Would you like to try some White Lily flour for yourself? And maybe a few goodies to go with it? Yes? 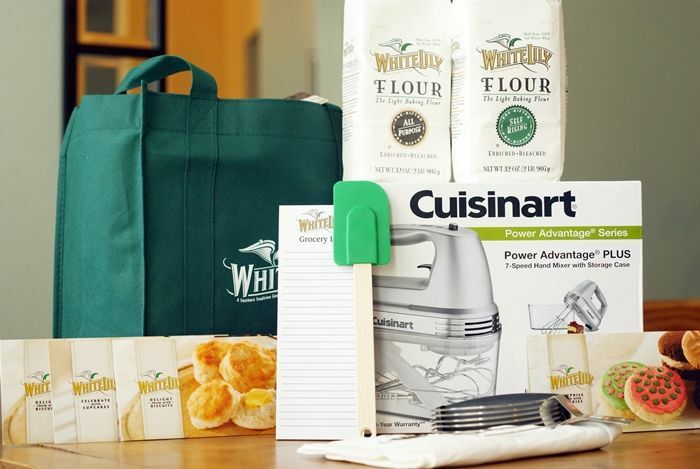 Here's what one lucky person will win: 2 bags of White Lily flour, spatula, grocery list, grocery bag, 3 recipe booklets, pastry blender, dish towel, and a Cuisinart hand mixer...perfect when you don't want to use your countertop mixer. Use the rafflecopter widget below to name one of the recipes from the White Lily website that you'd like to try...maybe it's a bread recipe, or breakfast recipe....or maybe DESSERT?!? You can enter using your email OR facebook...we're trying something new, so let's see how it goes. :) US residents only, please. Preheat oven to 400 degrees. Grease an 8x8" baking pan. 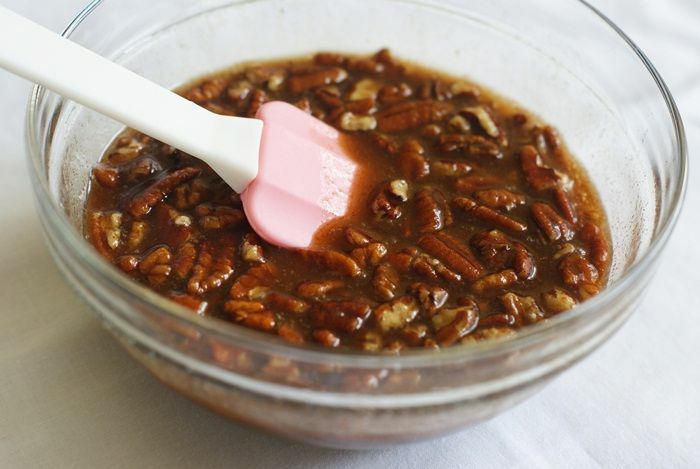 Stir together the melted butter, maple syrup, brown sugar, pecans, and cinnamon. Set aside. Place the flour in a medium bowl. Use a pastry blender to cut in the cold shortening until the mixture forms coarse crumbs. Stir in the buttermilk, just until the dough comes together. Dump the dough into the prepared pan. With floured hands, press the dough evenly into the pan. Pour the butter/pecan mixture over the dough. Bake for 16-18 minutes, or until the dough has risen and is done. Remove to a cooling rack and let sit 10 minutes. Meanwhile, make the cream cheese drizzle. Beat the cream cheese until soft. Beat in the sugar and vanilla. Add the milk and beat until smooth. Transfer to a piping bag or a baggie, cut off the tip and drizzle onto the warm cake. Serve warm. I most certainly DO like cake for breakfast! This sounds lovely. Oh my goodness, this looks fantastic!!! Salsa cornbread sounds really good! Be sure to use the widget above to enter the giveaway! Brioche, I've always wanted to try to make that! this one! i want to make this! Bridget- this looks amazing! I just printed this and saw the google docs for printing recipes. I have to check that out! I just entered to win the goodies too! This looks yummy! Gonna print this recipe out. This looks absolutely delicious!!! And what an awesome giveaway!!!! This looks wonderful. I'm hungry now! I might have to give this recipe a try. Ooh, yummy! 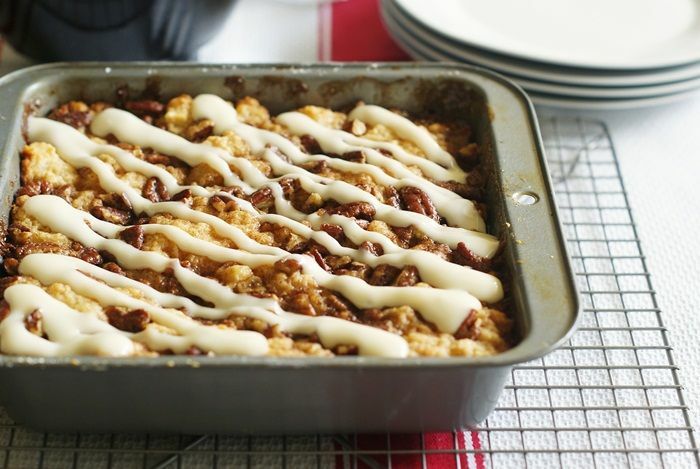 It's like a quick version of cinnamon rolls! Thanks so much! Bridget this looks soooo goood! I love the looks of this and what a fun giveaway! The lemon cake sounds amazing! BTW: I entered using my email with the copter thingy but I don't see my comment here. Cake for breakfast!? Any day! :) That's why I would love to try the Blueberry Muffins with Streusel Topping recipe! Sounds and looks sooo good! Be sure to use the Rafflecopter widget above to enter the giveaway! OMG! I's mouth watering!!! I love pecans! I would definitely want to try the salsa cornbread. LOVE cornbread and beans. Cake for breakfast? I'm there! Love the added cream cheese drizzle. Yum! Cake for breakfast?! Sign me up! I would like to make the cinnamon apple cake! Be sure to use the widget above to enter the giveaway! We're trying a new way to enter this time! Thanks! I would make the Chocolate-peanut butter cream pie with chocolate crust......Yum!!! Be sure to use the widget above (in the post) to enter the giveaway! Found this on Pinterest. Looks SO good!! Oh I cannot win, but I am so into cake for breakfast, it is just the right thing to do. I'm going to try this! Looks great! I would also like to try the Caramel-Apple Pie from the White Lily website. I would definitly want to try the Brioche'..........Love me some Brioche!!!!!! oh my word, this looks dis...alarmingly yummy! We're having this for breakfast this week. What's not to like about it! These sound like a heavenly (or sinful?) way to start a day... perfect either way. :) Love the drizzle topping! I'd like to try the date nut coffee cake! I have about 10 lbs of dates hanging out and I need to use them up! I'd love to try the Poppyseed Corn Muffins with Cheddar! I entered via e-mail. I would love to win this, especially since my hand mixer went K-A-P-U-T a few months back. I've heard a lot of good things about White Lily products. That is an amazing looking cake! Great minds think alike, I just posted about maple and pecans too haha! I love how this looks, delicious! This recipe looks delicious! I think I'll give it a whirl this coming weekend! I've never used White Lilly Flour although I've seen it called for in recipes. I love biscuits and have heard WLF makes wonderful biscuits. I'd make the HOT CROSS BUNS on the WLF recipe site. Thanks for the opportunity to win the prize. I want to try out the Chocolate Candy Bar Cake recipe!! I'm not entering the giveaway today :-) but I just had to comment because I live in Knoxville - home to White Lily Flour! 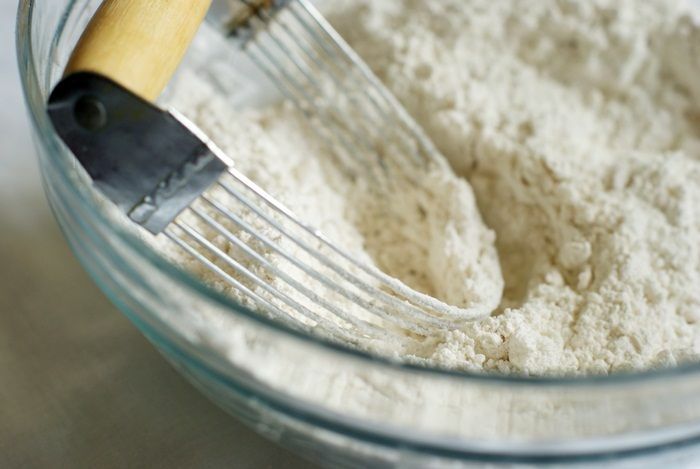 We LOVE White Lily around here - because it has a lower protein content (it's a "soft" flour), it makes fantastic tender biscuits, which are a Southern staple, and it's great for cakes, cookies, etc. too! So glad to see such a wonderful post on it - I wish the rest of country had easy access to this great company! Cake for breakfast is always a good way to start the day! After checking out the recipes on White Lily's site, I can't think of anything I'd rather try than the Maple Biscuit Cake you made here! Looks amazing and I would love to win! Yummy Buttermilk Chicken Tenders sound delish! I would love to try these! This sounds amazing! I love good old-fashioned coffee cakes. Reminds me of being at my Grandma's house! Cake for breakfast? Yes, please. I would have to leave off the pecans, though, I don't care for them. Entered! This is such a delicious looking breakfast, I'm okay with eating cake for breakfast :) And that is such a nice giveaway package, many thanks to White Lily! That's the same recipe that I made when I worked with them! My family loved it!!! I can't enter the giveaway. I just wanted to say that I think this is the most delicious thing I've laid my eyes on since those birthday cake Oreo brownies. The icing and then that last picture... it looks so fluffy! And hahaha. Yes, this cake is absolutely 100% guilt-free. I wish I had people coming over for breakfast soon! I have to make this. Anyway, that caramel apple pie looks to die for! 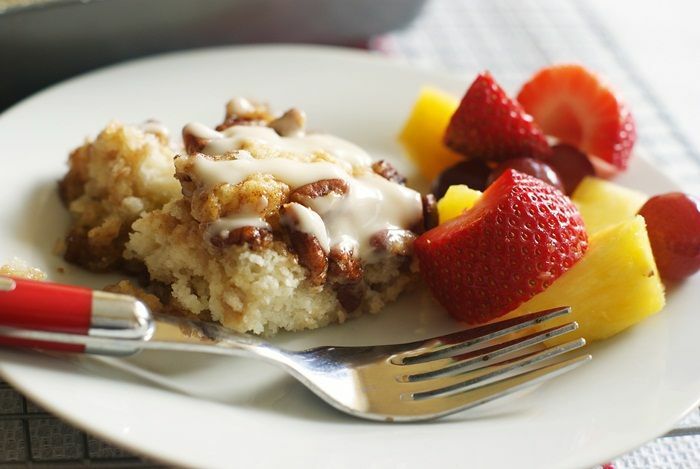 and I gotta make this breakfast cake! I can't enter either but hell no I never feel guilty eating cake, I need all the calories I can get at the moment, lol. Your photo brought back memories too. The red fork, we used to use these as kids at the dinner table. Ah, memories. 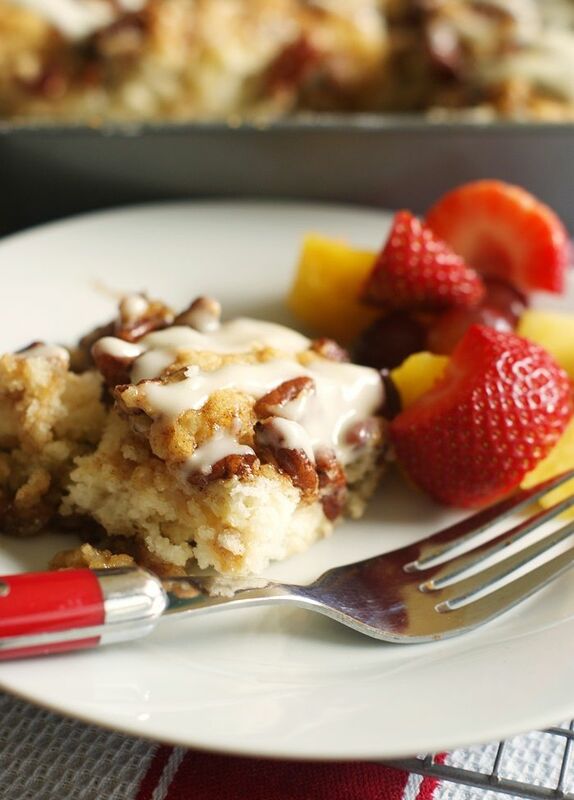 I figure if we all eat donuts for breakfast, then anything sweet is acceptable for breakfast:) Your biscuit cake looks delicious! I think it would get any sleepyhead out of bed! Whoa! This looks delicious and like my kinda breakfast! Love!!! 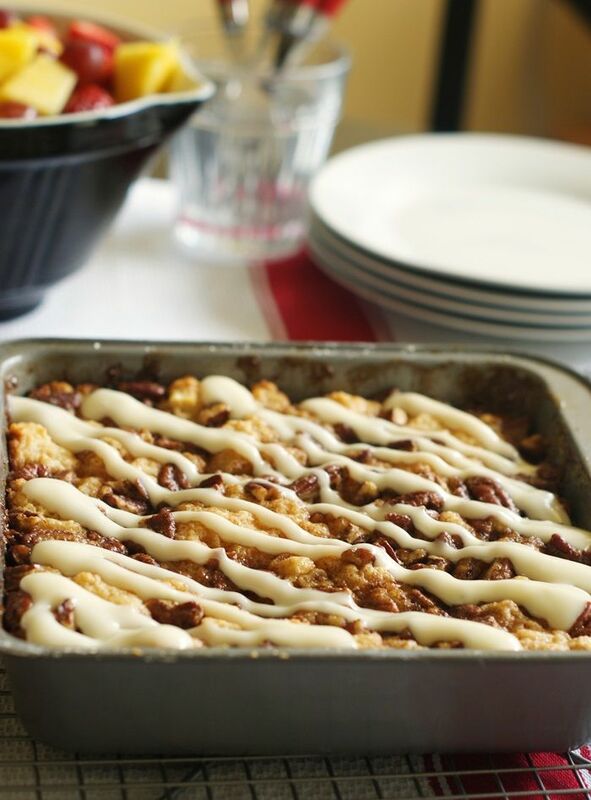 Banana Nut Snack cake does it for me! Your recipe looks delish too! Thanks for posting. The t-shirt, "Eat cake for breakfast" is a pretty 58 bucks. Yikes. I will just eat the cake and save the money! ;)This recipe looks great but shortening creeps me out. I will try with butter. Everyone is different. Blessings to you, Bridget. Love, Cindy K in Cali! I saw the title and thought 'hmm that sounds ok.' Then I saw the pictures and read about the cake and I was sold. Mouth-watering photos and delectable descriptions make all the difference. I love cake for breakfast! You see all the pageviews from Germany? That would be me. Because I keep coming back here. All the time. What an evil post! It just sits here, on the internet, at all times, taunting me. Calling my name, begging to be made. You are one evil woman, Miss Bridget. I want to try the White Lily Frosted Soft Suger Cookies..yummy! And I would pass out if I won!! These look great! I already entered the contest, but I have a question - do you think butter could be used instead of Crisco and give similar results, or is the shortening necessary to a good biscuit texture? Thanks! Now that's something good to wake up to. YUM! This is simply gorgeous! I'm adding this to my list for the next brunch I host...love it! Wow, wow, wow, my kind of breakfast!! That almond peach shortcake sounds yumyy!! I'd love to try the cheddar casserole bread! Looks yummy! So many recipes look good. I'd try the Chocolate Coconut Pecan bars first! Yum! 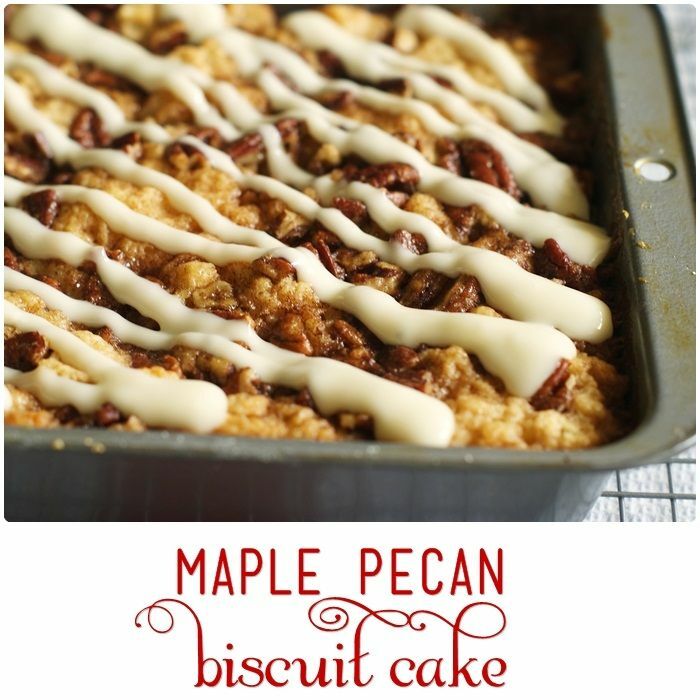 Sis will love this recipe, she's crazy for maple & pecans. Yummers. I want to try the Praline Filled Carrot Cake. I don't have access to the White Lily brand here but have heard the soft wheat they use is super for baking desserts. I'm hoping to win just for the flour, I gotta try it. White Lily has always been a top flour in the south and was milled right here in Knoxville TN!! It is THE ONLY FLOUR the women in my family have ever used. I have heard of people who have moved away bringing extra suitcases when they travel so they could fill them with White Lily. How did you like it Bridget? The dessert looks yummy! I have recently been converted to breakfast cake! This looks like one I will be trying very very soon!! Oh wow, looks so good. I might have to try it! Did anyone have trouble with the time on this cake? I've had mine in for 30 minutes and it's not done yet...followed recipe exactly. Any help is appreciated!